Rodgers has not adjusted to being Nelsonless. Get the ball out! He is a key to our offense, but he is always looking for the big play. Rodgers’ play must improve. He can’t catch his own passes. Vic, how is the view? Our defense looks like they are playing with 15 guys. I’m loving it. The defense is the strength of this team right now. Coach McCarthy went for it on fourth down on the first drive. Was that faith in the offense, faith in the defense or setting a tone for the rest of the game? It was all of those things and it was bold. I was shocked. The defense bailed out the offense on that one. Would have been very happy to be there at the game. A historic event. But glad to be with family tonight, warm and watching the game. Looks real wet out there. Imagine being squirted with a hose and then put in the refrigerator. I don’t know how these fans do it. The Packers can’t convert short yardage, missing twice already tonight. Why not? We talked about this in “Ask Vic” the other day. I blame it on zone-blocking schemes. I don’t think they’re especially good in short yardage. I think you need drive blockers for short yardage. Happy Thanksgiving, Vic! I’m concerned that a press box dinner won’t be adequate. Can we bring you anything? Frank Shirley over on Melody Lane? I’m having deer steaks today. I’d sure like to be out there in my deer stand. Does Aaron trust his receivers right now? I don’t think his trust is complete. 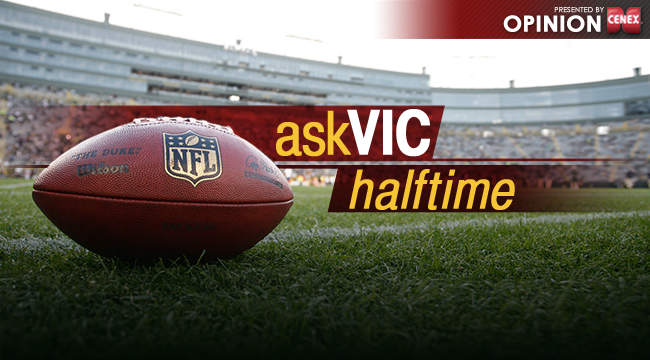 Vic, what do you really expect from Favre’s ceremony? Genuine emotion. Get ready for it.